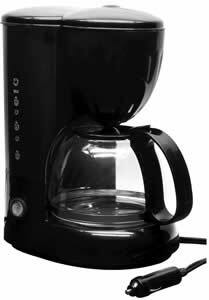 Enjoy fresh brewed coffee anywhere you travel using only the power from your vehicle's 12-volt power outlet. This portable coffee maker quickly makes 20-ounces in about 20 minutes. Imagine having the ability to brew fresh hot coffee wherever you are whenever you want. This portable coffee maker lets you do just that. The stop drip feature allows you to remove the carafe and pour a cup anytime you like during the brew cycle. An extra long 7-foot power cord means a power outlet will always be within reach whether in your car, semi-truck or RV. Includes coffee scoop and reusable filter basket which makes this appliance easy to use and clean-up while eliminating the need for paper filters. While this coffee maker is compact enough to stow away just about anywhere there's space it can also be mounted to your counter top using the included mounting bracket.